Wreath House [H5952] - $8.50 : Yarn Tree, Your wholesale source for cross stitch supplies. From Hands on Designs comes this holiday ornament with a house scene. 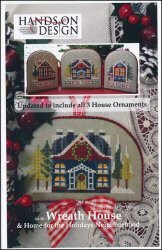 Stitch Wreath House as a single ornament or combine with Garland House and Snowflake House from the Just Cross Stitch Ornament issues to create a tri-fold holiday neighborhood scene. The border is included with this chart to combine the designs together. Stitch count for Wreath House Ornament is 77 x 44. Stitch count for the Home for the Holidays Neighborhood border is: Home 49 x 66, For The 76 x 71, and Holidays 52 x 66.